General Smiley, One of the First Dual-Toasters on the Jamaican Scene. 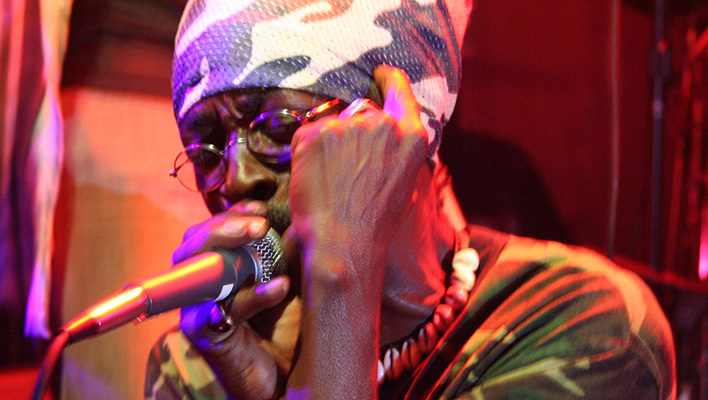 General Smiley began his career in the late 70s at Studio One under the direction of the late Sir Coxsone Dodd. The Duo Papa Michigan and General Smiley recorded their first number 1 hit Rub A Dub Style , followed by the equally popular Nice Up The Dance. The duo then recorded at Tuff Gong Studio the classic One Love Jamdown, produced by Jahmet Enwright, which was released as a double a-side with Freddie McGregors Jogging. Michigan And Smiley gave a dynamic performance at the annual Reggae Sunsplash Festival in 1981, which led to a debut appearance in the UK where they topped the bill at the Black Echoes Reggae Awards Show. In 1982 Henry Junjo Lawes productions dominated the dancehall introducing current DJs to a wider audience without attenuating the sound. Michigan And Smiley recorded a grim warning to prospective philanderers, Diseases, and the song inspired Yellowman to record an identical version alongside his sparring partner, Fathead. Throughout the 80s Michigan And Smiley sustained attention in the album charts with the releases Step By Step,Sugar Daddy, Back In The Biz and Reality Must Rule Again. The duo enjoyed a revival in the 90s when some of their earlier hits resurfaced through VP in the USA. Presently Michigan and Smiley still get Together for performances though they both are involve in their respective Projects within the realms of the art. Since 2005 General Smiley has been touring northern California, north east U.S, north west U.S and the south east U.S with some young artists such as Part One Tribe Band from Cocoa Beach Florida, Soul Medic from Navada City California along with Jah Works of Big Island Hawaii,Sgt Remo and Mr Kali from New Mexico along side Ken Serious from Clarendon JA touring with many top DJs. In 2008 when he passed through Austin, Texas on tour, General Smiley linked up with McPullish at Dub Compound Studio for a late night dub session after a show. When Smiley heard the music McPullish was working on he was inspired to record some new lyrics he had been carrying around in his head, thus creating their first collaboration: Natty Natty. Smiley also recorded some fiery dub specials that evening and these two have been collaborating ever since. Charlie is happy to report that a full length album and full dub companion album have been completed and are now available. General Smiley Meets McPullish At Dub Cove The music on this album is a fresh take on roots reggae, dub and more, drawing from a wide palette and many diverse influences. or clicking on the album covers or links below. This is where I stand up and say thank you all for your continuous support.